If you’re looking for an affordable upright bike, the Marcy NS-714U is definitely one model to put on your list. It’s a trainer made for light workouts and shares many similarities with the older version, Marcy ME-708. However, as opposed to the ME-708, this model comes with an adjustable handlebar and offers several more inches of adjustability for the upright seat bar. Although this Marcy exercise bike features a lightweight construction, its frame is pretty sturdy, designed to support users up to 300 lbs (136 kg). The fully assembled bike weighs only 41 lbs (23 kg), which means it’s not too difficult for only one person to transport and assemble. Plus, the front base bar integrates two small wheels which facilitate the unit’s relocation once it is assembled. Also, its rear base is equipped with polygonal rotating caps, which serve as stabilizers. The Marcy NS-714U does not have a folding design, such as the Exerpeutic Gold 500 XLS, for example. However, it’s far from being a large fitness machine. With all the parts assembled, its base is approx. 28″ (71 cm) long and 19″ (48 cm) wide. The handlebar tips extend over the front base, though, so the unit’s total length is approx 31″ (81 cm). So, these being said, the unit doesn’t take too much space, but it is recommended to leave at least two feet of clearance all around it for safe operation, and an easy entry/exit. The bike’s frame is made of cylindrical steel tubing, except for the longitudinal bar within the base part. There are, though, several ABS parts in its construction as well, these being the flywheel covers and several other small covers. All the steel parts in the bike’s construction are coated with a corrosion-resistant paint finish; the color used is gray, except for the crank arms which have a chrome finish. As we’ve mentioned above, the Marcy NS-714U features an adjustable handlebar, similar to the one on the Kettler Axos M-LA. Its height cannot be adjusted, but you can change its angle position via the small knob on the front. The handlebar features a multi-grip design. It’s fully covered by a layer of rubber foam material in order to deliver a secure and comfortable grip. However, it doesn’t integrate pulse sensors, and the bike’s console cannot track your pulse. The bike’s seat is only two-way adjustable (up, down). Its upright post offers several extra inches of adjustability compared to the ME-708 model. It has an adjustment span between 28″ and 40″ (71 – 101 cm). This means it can accommodate users between 4’10” and 6’1″ (147 – 185 cm) promoting a complete leg extension. 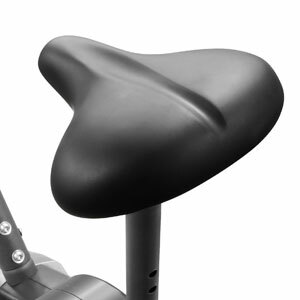 The saddle included with the bike features a standard design. It’s approx. 10″ (25.4 cm) long, and 10″ (25.4 cm) at its widest point. It integrates a layer of padding for optimal comfort. Its surface features a longitudinal groove to allow an optimal airflow and prevent overheating. 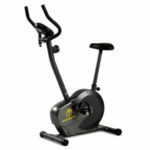 This Marcy exercise bike is equipped with a manual magnetic resistance system. 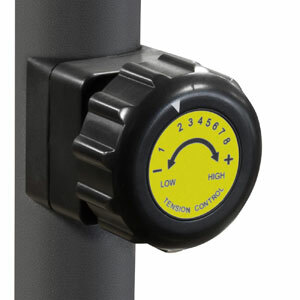 It consists of a small magnetic brake attached to the tension dial on the console mast through a steel cable. As you turn the knob clockwise, the brake will come closer to the flywheel increasing resistance. Conversely, if you turn the dial counter-clockwise, the brake will move away from the flywheel and the resistance will decrease. Needless to say, since the resistance is done manually, the bike does not require being connected to a powers source. There are 8 levels of resistance marked on the tension dial. The lower 1-2 levels provide very little resistance, these being recommended to users who require recovery training or a minimal stress on the joints due to various reasons. The top 7-8 tension levels aren’t extremely tough. The bike can deliver a mid-range resistance at best. However, when exercising on one of the top resistance settings and increasing your RPM, you can definitely achieve a consistent cardio workout. Like most upright exercise bikes with a magnetic resistance system, the Marcy NS-714U features a belt drive system. It uses a heavy-duty, stretch-resistant belt. The main advantages of a belt drive are the fact that it doesn’t require lubrication, it generates less vibration than a chain, and the pedaling motion is almost completely silent. The bike integrates a small perimeter-weighted flywheel which delivers a smooth and steady pedaling motion. Its weight is not specified but since the total weight of the bike is only 41 lbs, the flywheel weight is probably somewhere between 8-12 lbs (3.6 – 5.4 kg). The flywheel is not bi-directional. Differently put, if you pedal in reverse you won’t get any resistance. Also, pedaling in reverse is not recommended as it can result in damage to the internal parts. The bike is equipped with a durable crankset with solid steel crank arms. However, it’s an upright bike and doesn’t support standing up pedaling exercises as a spin bike. It’s recommended to only pedal when seated. 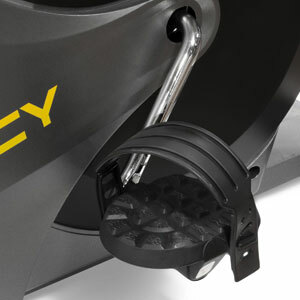 The included pedals are weighted and self-leveling. They’re equipped with adjustable straps. They have a non-slip surface and standard threads, so in case you need to replace them, compatible alternatives are widely available. 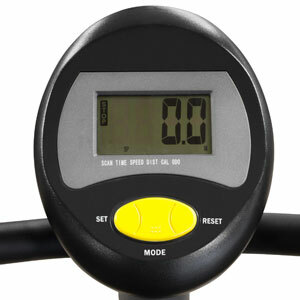 The Marcy NS-714U includes a basic fitness meter. It’s basically the same meter type as the one on the Marcy NS-716R recumbent bike. It features a 3.5″ LCD display which can track time, distance, total distance, speed, and calories. The bike doesn’t have pulse sensors and the unit cannot monitor your heart rate (it’s not compatible with HR chest strap transmitters). The unit is fairly easy to operate. To begin with, it has a SCAN function which rotates all the workout metrics showing each one for 4 seconds. The SCAN function can be toggled ON/OFF via the Mode button, so you can select one of the metrics to view at all time. The SET button gives you the possibility to set up a countdown target for time, distance and calories. While the Reset button clears all the values to zero. The unit uses 2 AA batteries which are not included. It has a sleep mode to which will enter after 8 minutes of inactivity on the bike. You can turn it on by pressing any of the buttons, or by pedaling. The base frame with the internal parts comes pre-assembled. You only need to attach the bike’s base bars, the console mast, the handlebars, the console, the seat post, the seat, and the pedals. This shouldn’t take more than 30-40 min. All the tools needed for the assembly are included. Also, the manual provides excellent step-by-step assembly instructions. Since the bike has a belt drive system, you don’t have to lubricate its internal parts. In fact, you don’t really have to do much for maintenance. The periodic check of its joins, bolts and nuts is recommended though. The Marcy NS-714U is a basic upright exercise bike for home use. 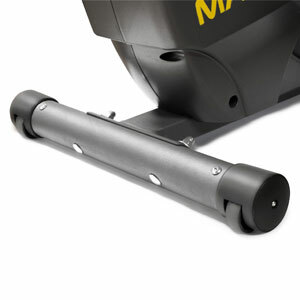 It features a solid steel frame with a weight capacity of 300 lbs and manual magnetic resistance. It has adjustable seat and handlebars, and also includes a basic fitness meter. It’s an exercise bike for beginners and intermediate users, great for light to medium cardio workouts, stamina training, recovery training and weight loss. You can actually burn up to 3-400 calories per hour on it, depending on the resistance levels used. And finally, it’s one of the most inexpensive exercise bikes available at the moment.